HB 109 as it's now known, is similarly worded to its failed predecessor. The imposed tax would be in addition to state and local taxes, and could see the price of a new game increase to as much as $70. The newly collected taxes would be appropriated to the Digital Protection for School Safety Account, which according to the bill's wording, is established for the "purpose of enhancing school safety measures implemented by school districts." Republican Chris Quinn, who also introduced the bill last year, is sponsoring the bill again. Quinn stated last year that he believes there's a link between violent video games and the rise of school shootings, where kids "act out" what they see in video games. Quinn also introduced Act 44 of 2018, which greatly overhauled requirements for schools in the sate of Pennsylvania, but he feels there's more that can be done at a state level. The Entertainment Software Association is taking a hardened stance against it, however, as they usually do. In a statement to Variety, the ESA put it rather bluntly. The ESA went on to call the bill “a violation of the U.S. Constitution.” Quinn's HB 109 was modeled after a similar bill proposed in Rhode Island that would've levied a 10 percent tax on violent video games, and then use the collected taxes to fund mental health programs. While this will likely create a 'shîtstorm', I do believe this to be a good idea. Even more so, they should use the money to stimulate non-violent gaming. To all who will shout censorship and whatnot, you probably don't have much contact with today's youth in 'the Western hemisphere'. Talk to nursery and primary school teachers. You have no idea how f***ed up many little kids (boys in particular) arrive there. Insisting on PG-18, R and such, doesn't help. They need to consider taxing micro-transactions. And leave rating specific titles alone. Micro-transactions is where the money seems to be. This is a little much... are we going to start taxing violent TV shows and movies as well?? Maybe give out fines to parents who get angry and violent around their children?? The real issue is not violent content, it is the lack of censorship by parents. Violent content has been around for as long as video media has existed. I know personally that I was never allowed to view violent content of any kind without parental consent. The real issues are being swept under the rug and pinned on a scapegoat. lipe123, Milest, PEnnn and 4 others like this. ...I know personally that I was never allowed to view violent content of any kind without parental consent. The real issues are being swept under the rug and pinned on a scapegoat. The problem is the family unit not the type of games that are being played. Milest, PEnnn, viperfl and 2 others like this. The money will simply get spent elsewhere (such as the annual pension / expenses raise by and for the same lawmakers introducing the bill). It always does. Whilst I agree, that's simply an extension of what most people have known for years - the most violent stuff of all that has the lasting impact with daily bombardment isn't video games, it's the "if it bleeds, it leads" tabloid news (for which social media is just an unregulated even more click-baity extension of). Milest, treetops and btfsttg like this. I didn't have a smartphone back then lol. I do see your point in asking that though. Maybe some parental controls associated with the device as I'm sure it would be on the parents account. Just a matter of actually utilizing the controls at that point. Define "Violent". One could argue that Super Mario Bros. on the NES is violent. You frequently need to jump on top of enemies, crushing them to death or incinerate them with fireballs. Swiftian 'modest' proposal - BAN everything. Make them play chess. Homework will be more entertaining than that. Think of all the homework which will get done. Little geniuses everywhere, thanks to the ban. Ban all the things! Ban errything but what I do! I do not believe this will resolve the violence at schools , 'cause firstly those games are developed for a specific age (18+) , but the parents are not doing their job right, then there's an issue. The state just want to make money our of it since there's a public that doesn't like those games, increasing taxes on the games will cause an increase on its prices only . Goverment can do better than that to resolve that situation .. If they want to raise money, legalize pot. IMO, it goes deeper than this. There is aggressive behavior all over the place right now and not just kids shooting up schools. If you ask me, the foundations of this are in the fundamental problems in society, especially, winner-take-all economic systems. The aggressive behavior is a symptom of the deeper problems, IMO. As I see it, politicians are not willing to look any further than the easiest possible explanation for society's problems in part because they would have to come to grips with how f'd up things really are. They would have to entertain how they have been and are part of the problem rather than the solution. Treating a symptom of the disease to alleviate the disease is perhaps far worse than looking for the root cause of the disease from the simple fact that treating the symptom has a tendency to mask the disease and make it appear that the disease, itself, is gone. Increase the price of violent guns (the ones that have been or could be connected to school murders) by 10% and use that money towards whatever amazing things that the government cannot afford to do currently. Tax all parents a further 10% all because 0.00001% of parents allowed their kids to commit school violence. Fine the parents 10 years of salary if their kids commit school violence. And then fine the kids 10 years of salary after they reach a working age (if they are still alive). So many options. All obviously garbage, yet equally as valid as the Pennsylvania Lawmaker's suggestion. Let's try something more productive: Education. Educate children in the schools on the difference between games and reality. In a game, you can shoot someone and walk away. In reality, you can shoot someone, and your life and your family's lives and the victim's family's lives are irreparably ruined. Explain that in detail. Teach children to respect life and to sort out their differences in useful ways. This is so flipping basic and common sense, I'm surprised it's even needed but if America wants to have a gun culture, then it needs to have gun responsibility as well. Ask the Canadians how they find balance. And, if America wants to make someone pay for all of this, make it the gun lobby. They can't push guns into people's hands and then turn their backs when the triggers get pulled. They need to be leading responsible gun use. Such as: you need to do a course before you can buy a gun. And a refresher course for each and every new gun. And severe punishments for parents if their kids use guns irresponsibly. And here are the ways you can and should maintain a gun in your home. Etc. I'm sure you can think of lots more useful guidelines. Find a balance between informative/useful and draconian. If you simply cannot be bothered to make your country a better place, then just do nothing, wait for the murders to happen and then go find someone to blame, in an unending cycle of uselessness. I know all nations are guilty of that in some form or another but that is where the problem is. That's what you need to fix. Video games? Sure. Put them at the bottom of a list of 10 causes and work your way down. lipe123 and PEnnn like this. Milest and cmc487 like this. The causal link between video games and school shootings is poorly demonstrated at best, and, more likely, is non-existent. Meanwhile 100% of school shootings have happened at schools. Should these lawmakers suggest banning schools? Once they realize that's an obvious no, maybe it's time to admit this proposal is entirely about a) wanting more taxes and b) some people not liking video games and trying to stick it to those who do. There is no reason to believe it will have anything to do with improving school safety. It seems like a particularly mean and useless proposal when it taxes virtual guns and ammo (I.e., the kind that can't actually hurt anyone), but not real life guns and ammo (the kinds that can.) Let me guess, the politicians behind this enjoy real life shooting but not video games? Maybe gamers need an organization like the NRA for themselves so we can avoid being bullied by these clowns too. wiyosaya and btfsttg like this. I didn't realize an inanimate object could be "violent". Milest and btfsttg like this. Too bad we can't tax parents for crappy parenting. That is the leading cause of violent behavior in our youth. Unfortunately in the end, you can't tax stupid. Milest, PEnnn and btfsttg like this. Video games don’t kill people. People kill people. When I play fifa, I sometimes go in rage mode and do sliding tackle from behind completely crashing my opponent. It is very violent even though the game isn't. Since the game isn't violent but the actions you might take can be, in state of Pennsylvania there should be a service, agents sent to the homes of people who play fifa and tax them whenever they do violent tackles. I would fire whoever came up with this retarded idea. Dumb **nt gets a very good salary and instead of working is just looking for the way to extract money from simple Americans. Just more ignorant people (lawmakers) who act on feelings instead of reasoning and facts. Or they know exactly what they're doing, but is that worse? Haven't there been tons of studies on this already? From what I recollect, there has been zero evidence to support that violent video games leads to violent people. Milest, wiyosaya and Lew Zealand like this. Yet they have no problem about airing documentaries on real serial killers\mass shooters in gruesome detail.... Showing dead bodies, describing murder methods. Also you are going to tax imaginary guns? What about real guns? Not that I think taxing solves anything. I remember watching Elmer Fudd hunting Bugs bunny with a shotgun. How about Wild E Coyote being blown up by dynamite. Daffy duck being hit over the head with a hammer. 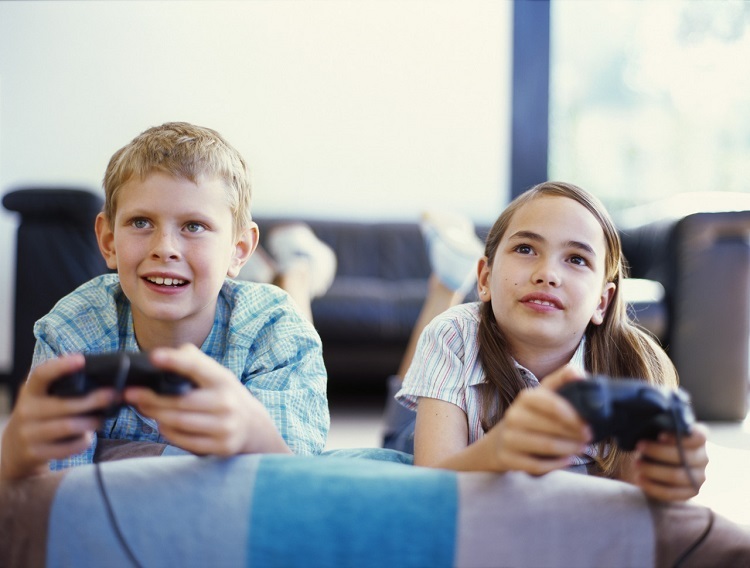 Don't blame video games for kids acting out. Blame the family structure. Blame the teachers, politicians, and Hollywood for getting kids confused. Milest, PEnnn and OutlawCecil like this.